Here are the other two layouts that I created this week using Studio J. Also- just click on the photo to see more detail! In case you wondered why I used the same (or some of the same) photos on yesterday's layouts- it's because one was for my album and the other layout was for my daughter's album... her layout is the one with photos of her on it!.. 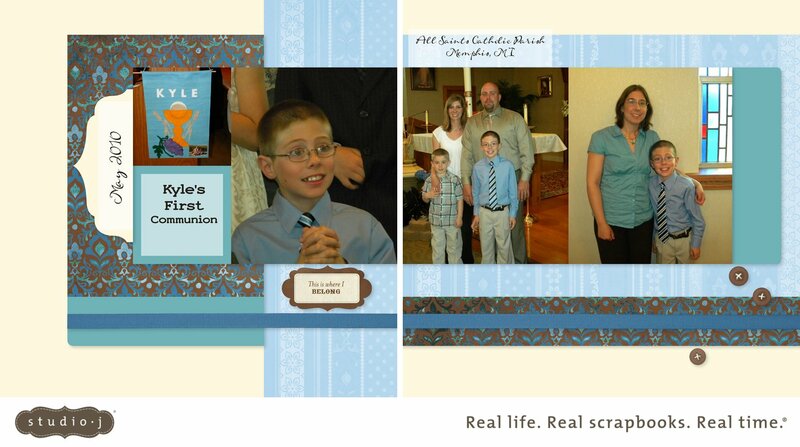 Today's layouts: This first one is a layout of my son!! I have so few layouts done of him. 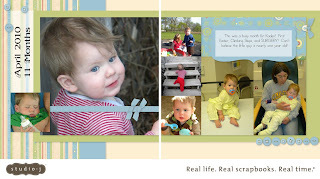 In my kid's "first year" album I typically do one layout per month and then Christmas, first birthday atc. Here's his 11 month layout: I used the Caboodle paper pack. This second layout is of my nephew and Godson Kyle's First Holy Communion. I used the Magnifique paper pack.